Gather around your TV for a movie marathon, a super-charged video game tournament or your favorite TV program with our Amish Centennial TV Stand with Four Doors and Two Drawers to help host the evening! This superior piece of solid wood furniture offers a spacious display surface for your TV, roomy cabinets for storage and lengthy drawers to help keep your DVDs, CDs, video games, remotes, game controls, books, puzzles and photo albums organized and at your fingertips. Keep your coffee table free from clutter and avoid drilling into smooth walls for TV mounts. The Amish Centennial combines style and function, resulting in a piece that is gorgeous to look at and serves many purposes to store and display your collections. 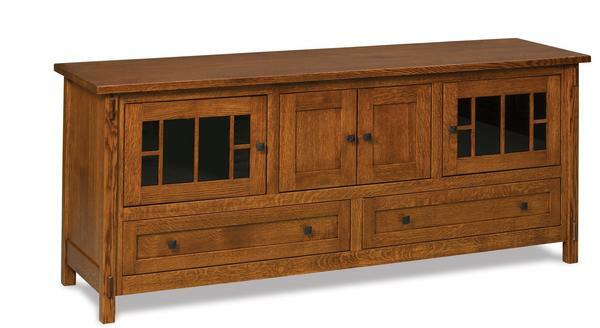 Dimensions: Width: 72" Depth: 19 3/4" Height: 29"
Consider our Amish Misson Style Corner TV Stand for another option.